The team behind acclaimed indie adventure Journey takes to smartphones to make "a game that touches people's hearts"
It’s easy – too easy, really – to dismiss mobile gaming at the moment. Smartphone app stores have become a wasteland of money-grubbing free-to-play Skinner boxes, the rare examples of real quality sinking amid a tidal wave of dreck. Yet all is not lost. 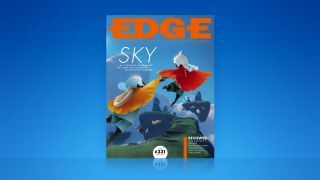 As Apple prepare their own vision for mobile gaming under the banner of Apple Arcade, the new issue of Edge magazine goes on sale; on the cover is Sky, the new game from Thatgamecompany, creator of Journey. It not only challenges the status quo for mobile games. It might just redefine it, too. In Edge’s world-exclusive look at the game - on-sale in UK newsagents right now and available as a digital magazine for a global audience - we go behind the scenes of something that takes Journey’s gentle ambient multiplayer and expands it, with support for eight players at a time, drawn from the largest, and broadest, audience of game-players on the planet. Yes, it is free-to-play – it wasn’t always planned to be so, but Apple intervened, fearing a paid-for game would sink like so many others. The original vision was for another Journey, essentially: a short, linear adventure. The game is much bigger now, and is no freemium moneysink, as co-founder and creative director Jenova Chen explains. "As a director, I never thought about spending money as part of the experience"
“My main perspective is how people feel,” he tells Edge. “And a lot of people, when they pay for these free-to-play games, I guess they feel somewhat shameful? Because it’s self-weakness – you know, ‘If I just pay a buck, I can beat this level’. Or, ‘I want to get a loot box with a legendary drop – just two more bucks’. That’s promising stuff, and our time with the game is even more so. It’s a massive, multiplayer Journey in your pocket, and has the potential not only to change the consensus around mobile games, but to change our relationships with our closest electronic companions. Smartphones have changed the world, but they have made it a more solitary one, our gazes fixed downwards at our own private Internet. This, like Journey before it, is a game that will bring people together. It’s quite exciting. What else can you expect in the new issue of Edge? There’s plenty more in Edge 331: a look at why the military’s recruitment wing has a new generation of game-players in its sights, a look back at EverQuest’s 20-year history and, appropriately given the cover star, a new company hand-restoring lost iOS classics. And, as ever, a bunch of reviews with numbers on the end that people will start being weirdly cross about within about 15 minutes of subscriber issues hitting doormats. Edge 331 is on-sale now in all UK newsagents. Readers from the US, Europe or rest of world can be first to read Edge's exclusive previews, interviews and features each month with these Edge magazine subscription print and digital subscription offers.